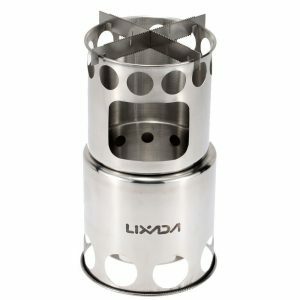 Lixada Portable Stainless Steel Wood Stove Lightweight Camping Cooking Burner. Lixada wood stove is a must-have for all serious backpackers, survivalists and stealth campers. Some of these stoves great features are an open mouth for convenient stick burning, being environmentally friendly with no fuel canisters, no chemical emissions, no batteries, with less carbon footprint. Cooking with twigs you collect on your camp means a free unlimited fuel source.